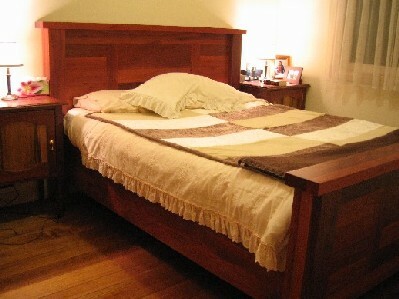 This bed has been made from Jarrah timber and is not something to be moved often - it's heavy! The design brief was a very heavy, chunky style with feature and different toning of the timber. The customers love it and still talk of it after many years. It has been finished in 2 pack satin lacquer and is expected to be appreciated by family generations for a long time.